Total nonresidential construction spending decreased 0.8 percent in January to $566.4 billion, according to the March 1 report by the U.S. Commerce Department. 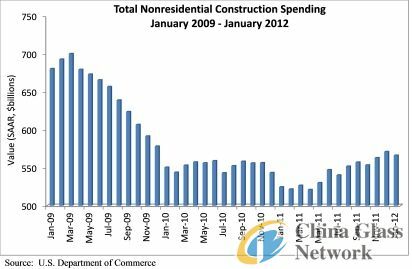 However, total nonresidential construction spending was up 7.9 percent from January 2011. Private nonresidential construction spending was down 1.5 percent for the month, but was 16.6 percent higher than one year ago. Public nonresidential construction spending was down 0.1 percent for January, but was up 0.4 percent from the same time last year. Construction subsectors posting the largest monthly decreases in spending included manufacturing, down 6.3 percent; lodging, 3.9 percent lower; and religious-related construction, down 3.5 percent. Subsectors with the largest year-over-year decreases in spending included religious, down 23.1 percent; conservation and development, 17.8 percent lower; and transportation-related construction, down 6.5 percent. Five of the sixteen nonresidential construction subsectors posted spending increases for the month, including water supply, up 9.7 percent; amusement and recreation, 2.1 percent higher; transportation, up 1 percent; health care, up 0.9 percent; and public safety, up 0.3 percent. Eleven of the sixteen subsectors posted increases in year-over-year spending, including manufacturing, up 38.3 percent; power, up 24.4 percent; and health care, up 9.7 percent. Residential construction spending increased 1.6 percent in January and was 5.4 percent higher than the same time last year. Overall, total construction spending – which includes both nonresidential and residential – slipped 0.1 percent in for the month, but was up 7.1 percent compared to January 2011.